Master of Ceremonies Mark L. Nestor, left, a former U.S. Army helicopter pilot who served in Vietnam, and Gov. 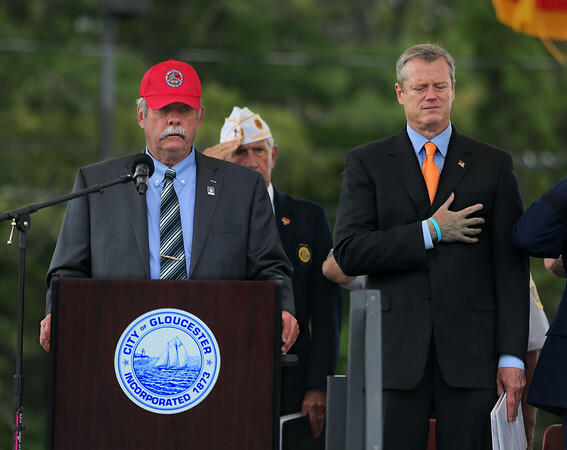 Charlie Baker stand during a solemn moment in the Opening Ceremony Thursday at the Wall That Heals in Gloucester. The Wall, a replica of the Vietnam Veterans Memorial in Washington D.C., contains the names of over 58,000 servicemen and women who gave their lives in service during the Vietnam War, and will be open for public viewing at the former Fuller School grounds until 4 p.m. Sunday.